WASHINGTON D.C. -- José Díaz-Balart, chief political analyst for Telemundo, had one important task during the September 7, 2011, Republican debate—to ask the candidates about immigration. Díaz-Balart asked his question, got his answer and was dismissed from the stage. The stereotype was fulfilled; a Latino asked one question and the one question was about immigration. With that box checked, the moderators and candidates were able to return to “non-Latino” issues. The problem is, the issues that keep Latinos up at night—like double-digit unemployment rates, living at the poverty end of the wealth gap and having the highest high school dropout rates in the country—go well beyond immigration. Herein lies the challenge for President Obama. He must recast his connection with Latino voters beyond a narrow focus on immigration and engage Latinos as the multi-issue electorate they are. It’s easy to see why Latinos have been typecast within the narrow frame of immigration. The vast majority are immigrants or the children or grandchildren of immigrants. In 2008 then-candidate Barack Obama used the issue to connect with Latinos by highlighting the importance of immigration reform. This strategy was wildly successful and netted him close to 70 percent of the Latino vote. Today that strategy is counterproductive. Latino voters are keenly aware that “La Promesa de Obama”—as his campaign pledge for comprehensive immigration reform became known—was not fulfilled. And now they have other priorities: according to the latest impreMedia-Latino Decisions tracking polls, economics have eclipsed immigration as their top concern. For Latinos, the economy and the related issue of education have come to demand the same level of attention that President Obama once gave immigration. 13.9 percent; today it’s 11 percent. Latinos have been the hardest hit in the recession, and they have the steepest climb to recovery. According to the Pew Hispanic Center, Latino median wealth plummeted 66 percent between 2005 and 2009. The decrease in wealth nationally was the most acute among Latinos, leaving one-third of the community either with debt or no assets. Latinos are not only losing their jobs, benefits and homes but their hard-earned position in the middle class. Within one generation families have gone from working class to middle class and back to working class again. The wealth gap between minorities and non-minorities is the largest since the Census Bureau began providing this information in 1984. The white-to-Latino ratio of median wealth in 2009 stood at 18 to 1, more than twice the ratio before the recession. The gap between rich and poor has also become a serious problem within the Latino community, with their wealth disparity the greatest of any group. In addition to having experienced the steepest decrease in wealth, Latinos have the highest birthrates and the lowest levels of education. Latino dropout rates are triple those of whites and double those of African-Americans. Education is particularly important to Latinos because more than one-third are under 18. In 2008–09, in the two largest public school districts, New York City and Los Angeles, Latino children made up 41 percent and 74 percent, respectively, of incoming first graders. At first glance it would seem that because of the magnitude of their economic losses and their grim educational position, Latinos would be the most punishing of the president’s policies. But the data suggest that Latinos want more government involvement, not less, making them unreceptive to the message of the GOP and particularly the Tea Party. During last summer’s debt debate, an impreMedia-Latino Decisions poll showed that 83 percent of Latino voters supported some sort of tax increase in the debt reduction plan. As reflected in the figure below, forty-five percent supported a taxes-only route. 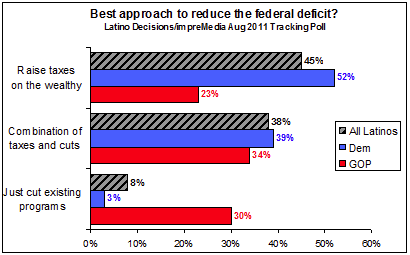 Even a majority of Latino Republicans preferred some taxation over a cuts-only approach to the deficit. For Latinos, economic well-being is intimately tied to the economic recovery of the nation; they are progressives who support a robust federal government. The proposal to create a National Infrastructure Bank to bring about job creation is exactly the type of policy that resonates with them. The GOP has also failed to win the support of Latinos on education. The impreMedia-Latino Decisions polls show that 57 percent of Latino voters support President Obama and the Democrats’ education policy, which has emphasized early childhood education, school reforms and developing community partnerships. Republicans were seen as the better option by 20 percent and a disillusioned 14 percent lacked confidence in both parties. Indeed, the Latino community’s most tangible achievements under the Obama administration are in the realm of education. The education gap between Latinos and non-Latinos shows clear signs of shrinkage. Dropout rates are decreasing, and from 2009 to 2010 Latino college enrollment grew 24 percent, an increase of 5 percent over the previous year. And yet, despite recent comments by Jim Messina, President Obama’s 2012 campaign manager, Latino support is not a given for the president. In a December 2011 impreMedia-Latino Decisions poll, 54 percent of registered Latinos said they were certain to vote for Obama. This is a long way from the 70 percent of 2008. Tangible disillusionment was also apparent in the decreased rate of turnout among Latino voters in the 2010 midterm elections, the Pew Hispanic Center reported. In 2011 the president’s approval ratings among Latinos hovered in the 60 percent range. However, this aggregate figure combines “Strongly Approve” and “Somewhat Approve,” obscuring the fact that more than half of his approval is from the lukewarm “Somewhat Approve” category. The implication is grave, since participation is fueled by enthusiastic voters who have strong feelings about their candidate. If the president is to get past his failed immigration pledge and reconnect with Latino voters, he must do two things: highlight the natural ideological affinities between himself and Latinos, and showcase the economic and educational programs he has implemented and will continue to promote. Simple electoral math puts Latinos at the forefront of the president’s re-election strategy in the 2012 election. Latino voters make up at least 15 percent of the population in half of the top swing states—Colorado, Florida, New Mexico and Nevada. They are a crucial part of the electoral formula necessary to prevent President Obama from being the third Democratic president in history not to get a second term in office—and they deserve to have the full range of their concerns understood. You can also listen to an accompanying podcast featuring Dr. DeFrancesco Soto here.